Sisalation is a high quality radiant barrier also known as reflective foil insulation. This product is a combination of aluminium foil that has been laminated to kraft paper or cloth that has been woven. Sisalation will help keep you cooler in summer by reflecting solar heat that radiates from the sun. It is a cost effective product that helps reduce your power consumption in summer by keeping your building cooler inside. Reflective radiant barriers are installed in your roof the same way your plastic underlay is installed. It’s rolled out over the top of your roof trusses and under your tiles. It is easier to install sisalation during construction stage before the roof tiles get installed, but it can be retrofitted to an existing building or home if need be. It is most commonly used in commercial and industrial buildings, schools, factories, warehouses, mini-factories even schools and clinics. Sisalation acts as a water barrier and prevents moisture and even dust from entering your roof. In fact you should rather install a reflective radiant barrier than the usual plastic underlay because you get more benefits with it. Plastic underlay is really just there to prevent water from entering your roof. Sisalation insulation prevents water and solar heat from entering making it a far superior product to use. The combination of a reflective foil insulation and a small air gap make the product a highly efficient thermal membrane. The aluminium foil surface has low emissive properties. When used as roof lining in buildings, the reflectivity of the product will even enhance the lighting inside the structure. Sisalation reflective foil is also very good as a water barrier. Instead of using the standard plastic underlay in your roof consider using a radiant barrier, it will last longer as well. Does Sisalation have an R-value? Radiant barriers themselves don’t have an R-value. You can only calculate the resistance of the product when all the roofing materials and components used within the structure are included in the calculation. 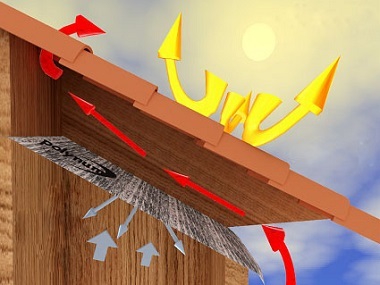 Radiant barriers reflect solar heat. If you are looking for an R-value you will need to install a bulk ceiling insulation (preferably fiberglass or polyester insulation). Does dust affect sisalation insulation? All radiant barriers are affected by dust. It doesn’t mean they completely lose their reflectiveness, but it will to a certain extent. The water and moisture barrier will remain un-effected by dust.